VH Nutrition's Folliform helps create healthier hair by using a nutritional approach. Using Folliform with a diet that supports hair regrowth is essential to prevent hair loss and thinning hair. Using a natural supplement like Folliform can help block the production of DHT. We use only the highest quality saw palmetto extract, serenoa repens, cucurbita moschata, and others in our proprietary blend. Rather than subject your body to other ingredients like Shen Min, NuHair, Hairomega, and NISIM we keep all of our DHT Blocker ingredients natural and healthy . Click on the label above to see all of the ingredients Folliform contains. How Do DHT Blockers Work? DHT's (or Dihydrotestosterone) effects on the body have been well documented to show that it tends to collect on the scalp causing damage to hair follicles and causing hair loss. Losing your hair is a traumatic experience that can seriously undermine your self-esteem. Fortunately, there are treatments to help slow the progression of hair loss and restore ideal scalp conditions that allow hair to regrow. One popular and powerful type of hair loss treatment is a DHT blocker. However, users of Folliform have reported that their hair feels thicker, healthier, and fuller than before and their concern of hair loss has been eliminated. Many things can cause hair loss, but most cases are due to androgenetic alopecia; this simply means that a combination of genetics and hormones are responsible for the condition. The specific male hormone associated with hair loss is dihydrotestosterone (DHT). It is created in the prostate, testes, adrenal glands and hair follicles by an enzyme called 5-alpha-reductase. DHT is present in both men and women, and it becomes more prevalent with age. This potent hormone is the underlying cause of 95 percent of male pattern baldness, and it may also contribute to female baldness or thinning hair. Genetic makeup determines how much DHT the body produces as it ages. More DHT generally equals more hair loss. Although many assume that baldness or thinning hair is a result of hair falling out, this is not always true. It is perfectly normal to lose between 50 and 200 hairs in one day. Although some types of hair loss do involve the shedding of large amounts of hair at once, most cases are due to the inability of new hair to grow. DHT causes hair loss by miniaturizing or shrinking the hair follicles. When high levels of 5-alpha-reductase are present in the cells of hair follicles and sebaceous glands, the enzyme converts testosterone into DHT. The DHT attaches itself to cells in vulnerable hair follicles and reduces blood flow. This action prevents proteins, vitamins and other nutrients from nourishing the follicles. As a result, follicles shrink, and hair is regrown at a slower rate and with a thinner shaft. 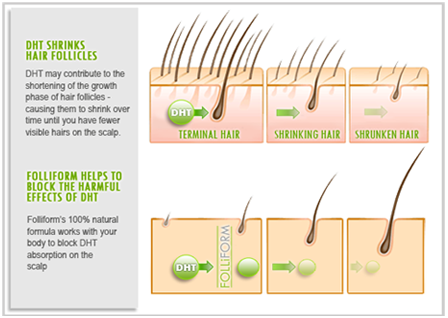 With the passing of each new growth cycle, DHT makes it progressively difficult for hair to grow normally. Eventually, all hair stops emerging. 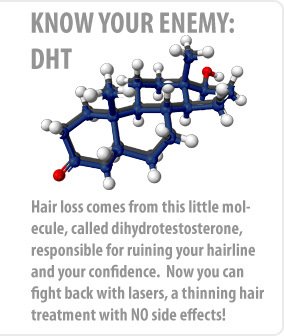 When the actions of DHT are prevented by DHT blockers, hair follicles are free to resume their natural growth pattern. How Do Natural DHT Blockers Work? DHT is not necessary for health, so you won’t cause yourself any harm by blocking its actions or production. There are several ways to effectively block the hormone, and various medications or treatments work in different ways. Here are brief explanations of the most common DHT blocker products. DHT-blocking shampoos help remove excess DHT from the scalp and prevent the enzyme conversion that leads to DHT production. They typically contain active ingredients such as Trichogen complex and zinc. Prescription DHT blockers include Avodart (dutasteride) and Propecia (finasteride). Both drugs work by inhibiting the activities of 5-alpha-reductase in the body. Avodart affects two different types of the enzyme, while Propecia is active against one. Natural alternatives to prescription DHT blockers eliminate the risks of drug side effects and may be safer for women. These include supplements such as saw palmetto, pygeum, nettles, emu oil, pumpkin seed oil and beta sitosterols. Over-the-counter DHT blockers may be effective for many hair loss victims, but the strongest treatments require a prescription. To find out if you are a candidate for prescription DHT blockers, talk to your primary care physician or dermatologist about your hair loss treatment options. If the cause of your hair loss is androgenetic alopecia, these products may be able to help restore your hairline and your confidence. Q. Does Folliform™ have any side effects? A. All of the ingredients in Folliform are 100% natural and no negative side effects have been reported when taken as recommended. Q. How quickly should I expect to notice results? A. Most users report hunger symptoms with one hour of the first use, typically at a serving size of 4 capsules. Q. Does Folliform™ work for everyone? A. Most users report a slowing or cessation of hair loss within 30 days, and many see increases in hair thickness,hair count and scalp health within 90 days. Improved libido, mood and general health have also been reported by those using Folliform. Factors such as metabolic rate, age, activity level, stress levels and other physiological factors may contribute to variance in the reported effects of the product and the rate at which these effects can be felt. A. Folliform™ orders are processed within 24 hrs. and ship the following day. All orders are shipped first class USPS and arrive within 2 to 4 days. Shen Min DHT Blockers for Men and Women: Shen Min is a dht blocker that is produced to create the similar results to Folliform. It uses natural products and ingredients in a blend with other ingredients that cause hair growth and improved hair thickness, health, and shine. Hairomega Hair Care Product List: Hairomega products for healthier hair say that they fight to address the 3 conditions that cause hairloss; poor circulation, production of DHT, and nutritional deficits caused by diet. Their products claim to improve hair metabolism and deliver a better hair care product result. NISIM DHT Blocker Shampoo: NISIM's products say that they provide the best hair care products for hair growth and loss prevention and that their product will bring stronger hair that is healthier. As a skin and beauty product company they offer a wide range of products to help remove unwanted hair growth while improving scalp health and vitality. I got this for my hubby just after Turkey day... lookin' better already! After 3 months we are seeing a good amount of hair loss reduction and are beginning to see signs of new hair growth as well. My product took a bit to come but so far has been amazing.